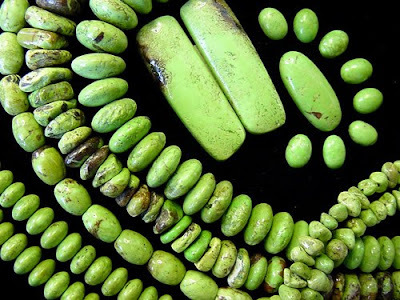 Lore: Lemon Chrysoprase is an ideal aid for recovering from a long period of illness. Geology: Lemon Chrysoprase is one of a family of siliceous nickeliferous magnesium carbonates. Gaspeite is another member of this family. The green color is due to the presence of high levels of nickel. Lore: Leopardskin Jasper helps us deal with strenuous life situations calmly with awareness of our strength. Use it to fortify feelings of self-respect. Leopardskin Jasper is emotionally balancing. 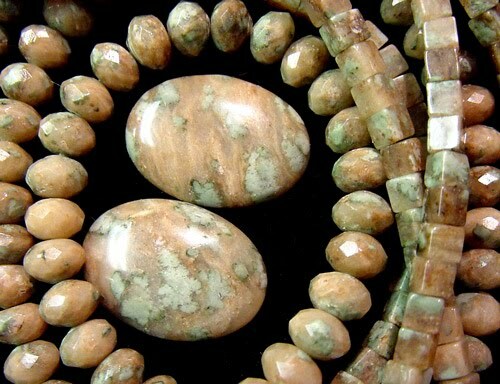 Geology: Leopardskin jasper is a type of rhyolite which is sandy colored with glassy black inclusions. The term jasper is misleading. Rhyolite is a volcanic rock consisting mainly of quartz, feldspar, and hornblende. 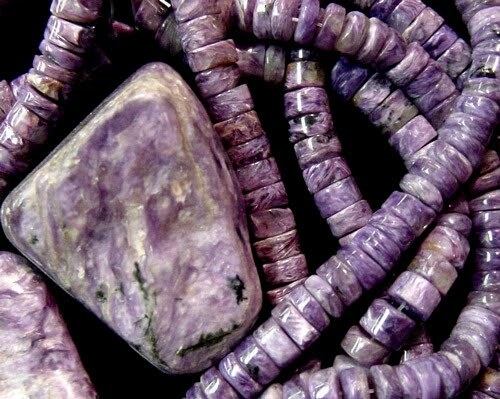 Lore: Lepidolite encourages independence and inner peace. It promotes restful sleep, and helps us to preserve our own space in crowds. Lepidolite aids in goal-setting and decision-making while neutralizing distractions. 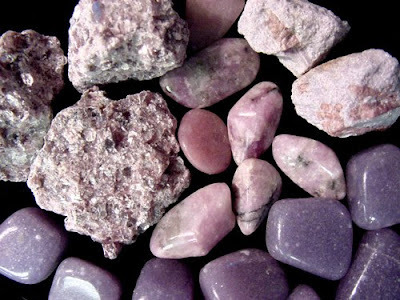 Geology: Lepidolite is lilac colored mica containing lithium. It occurs in granite pegmatites associated with tourmaline and other minerals and forms as scaly aggregates, cleavable masses, or tabular crystals. Lore: The Tantric Lingam, one of the oldest religious symbols, is associated with the Hindu deity Shiva, the Lord of Creation. It unifies and balances male and female energies within us and activates the movement of kundalini energy throughout the chakras. 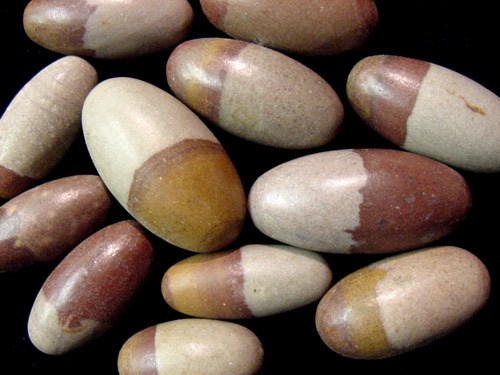 Geology: Lingam stone consist or a rare form of chalcedony or crypto-crystalline quartz with inclusions of iron oxide and goethite. Naturally tumbled and shaped by the river, they are ceremoniously gathered on the full moon. 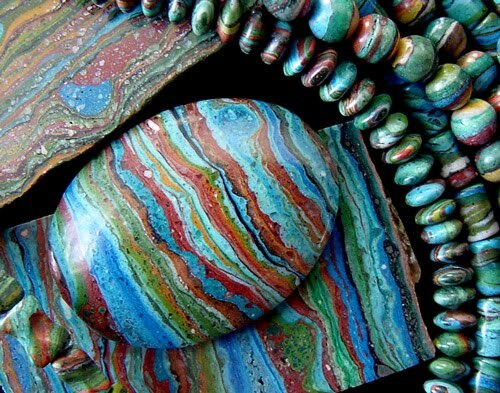 Lore: Malachite was a woman’s mineral dedicated in numerous cultures to the goddess. It can help create an unobstructed path towards personal goals. Geology: Malachite is a carbonate formed through a secondary process in the oxidation zone of copper ore deposits. It often occurs in botryoidal masses with a fibrous, banded structure that shows concentric internal banding when cut and polished. 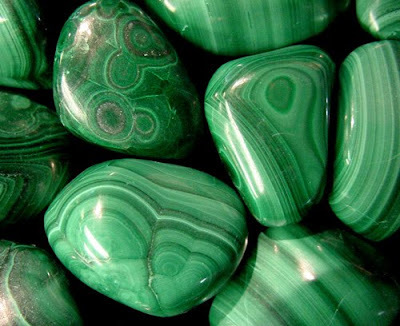 Avoid acids, ammonia, and salt water when wearing malachite jewelry. 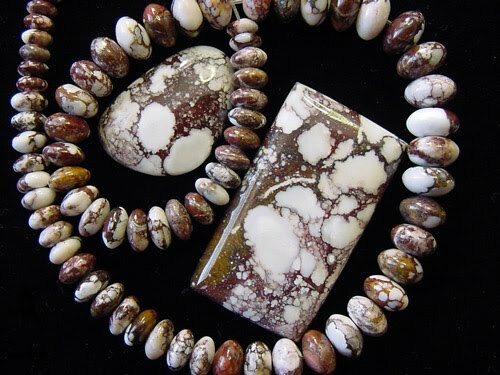 Lore: Marbled jasper assists in the healing of animals. It is useful to promote the flow of chi energy during acupuncture or acupressure and to energize the hand chakras. It brings strength to those living in close proximity to the earth and may be used to facilitate astral travel. 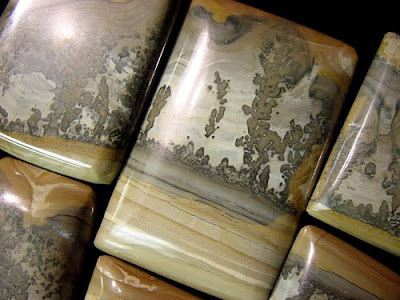 Geology: Jasper is fine-grained quartz containing particles which were suspended in the original silicic acid solution giving it an opaque color and markings. Lore: Mochi marbles were sacred among the shamanic members of ancient tribes who used them for contact with the extra-terrestrial, for visioning, and for journeying. They have been found in archaeological excavations on several continents. 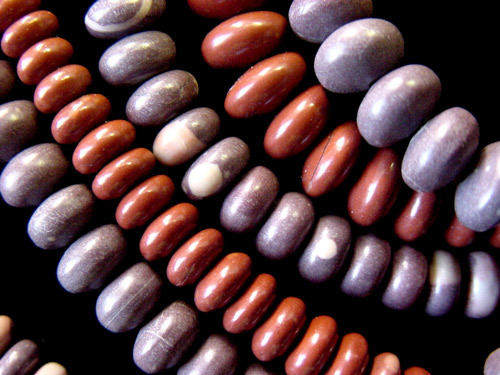 Mochi marbles can be used to align the energy centers, to relieve energy blockages, to stimulate ch’i, to ground and center, to provide protection, and perform healing for the earth. Use in pairs is recommended. 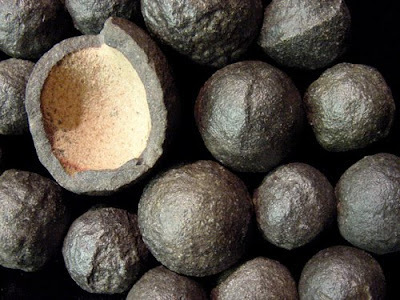 Geology: Mochi Marbles are concretions of iron which consist of an outer shell of hematite (iron oxide) with a center of sandstone. They occur in the lower part of the Navajo Sandstone formation in southern Utah and northern Arizona. It is believed that the venting of hot volcanic gases caused the mochi marbles to form. Lore: Mookaite provides a shield in situations of danger. Strengthening communication with animals, it also stimulates contact with loved ones who have passed on to the next plane. Promoting energy and new ideas, it serves as a catalyst for emotional growth. It is good for those who take life too seriously or isolate themselves due to fear. Geology: Mookaite is a type of varicolored chert named for its locality in Mooka Station near the Gascoyne River in Western Australia. Mookaite was created by the weathering of a silica rich sediment containing fossilized marine micro-organisms. Lore: Mother-of-pearl carries the gentle, peaceful healing energy of the sea. It relaxes, soothes emotions, lessens feelings of sensitivity and helps reduce stress. Healing to those who are idealistic or realists, it aids in the attainment of acceptance. Mother-of-Pearl is a strong healer of the instinctive center, lessening survival-oriented fears. It is a source of cohesive energy when used in a group. 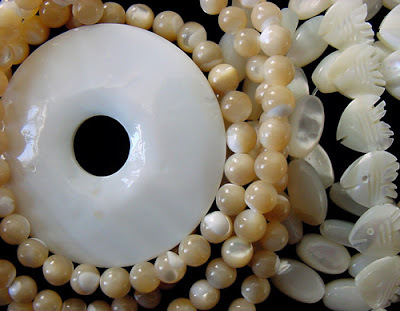 Geology: Sometimes referred to as MOP, mother-of-pearl is derived from the glossy inside of the pearl oyster shell. Lore: Use nunderite to protect from discovery and to keep secrets. 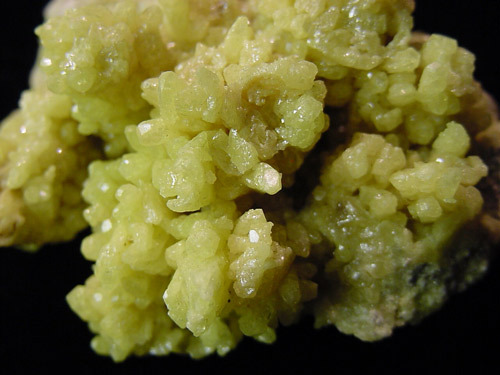 Nunderite increases ability in activities related to water and provides safety in water travel. Place on third eye to aid in remote viewing. Geology: Nunderite combines andalusite, quartz and green epidote. Lore: Ocean Jasper contributes to healing the emotions and is a supreme nurturer reminding us to bring joy to others. It strengthens the mind and supports courage. Geology: An orbicular jasper full of circles or orbs of contrasting colors, the green, pinkish and white patterns often contain tiny cavities lined with crystals. It is mined along the seacoast of Madagascar near Marovato. 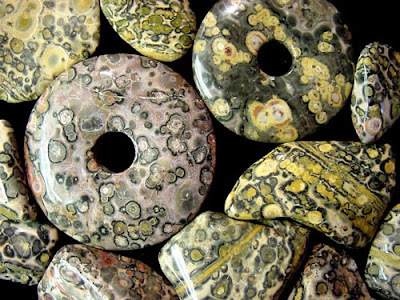 First documented in 1922 and then forgotten, ocean jasper was re-introduced at the 2000 Tucson Show. Lore: Orthoceras fossils help to heighten accomplishments in the world of business. Geology: Orthocerids are the most common of the straight Paleozioc cephalopods. Cone shaped, they consist of a central siphuncle filled with calcareous deposits and are ornamented with transverse ribs. Their age is Lower Ordovician through Upper Triassic. Their phylum is Mollusca and their subclass is Nautiloidea. 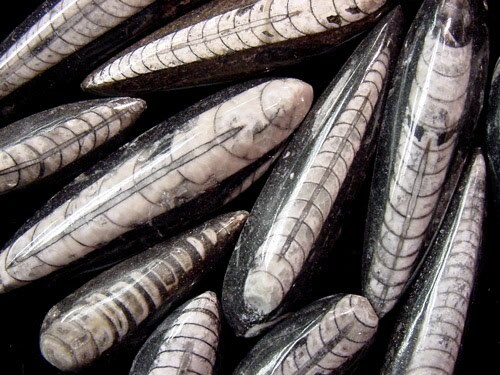 Orthoceras is the name for European species; those found in North America are called Michelinoceris. Lore: Peridot, also called Olivine, helps to regulate physical and emotional life cycles. It allows detachment from outside influences and helps us live our own lives. Peridot also encourages us to admit mistakes and to forgive ourselves. 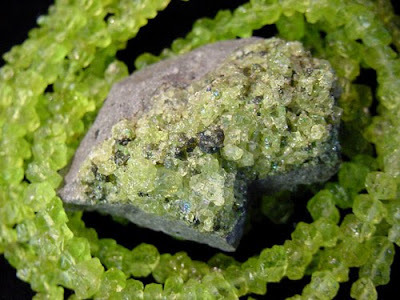 Geology: Peridot is formed in deep rock out of ultra-alkaline magma. Often brought to the surface during volcanic eruptions and found as an ‘olivine bomb’ embedded in volcanic rock. Lore: Picasso stone can assist in the development of creative talents. It strengthens self-control, supporting serenity and pure thought. Use picasso stone to enhance common sense in matters of the heart and of the home. Geology: Picasso stone is a type of marble which is a metamorphosed limestone of recrystalized dolomite or calcite. The color range includes a combination of black, brown, tan, yellow, and gray. Lore: Pipestone is used by Native American Indians for the carving of sacred pipes, fetishes and totems. Look to the spirit world to provide guidance in using pipestone in an intuitive manner. 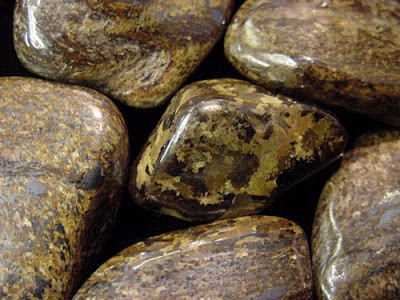 A stone for those drawn to the “old ways,” pipestone will empower ceremonies and enhance pursuits when handled with respect. Geology: Pipestone, also known as Catlinite, is a fine, compact siliceous clay colored red by iron. The principal locality is in Minnesota, where a large quarry has been worked for hundreds of years. Even warring tribes came to the quarry, now a National Monument, in peace. 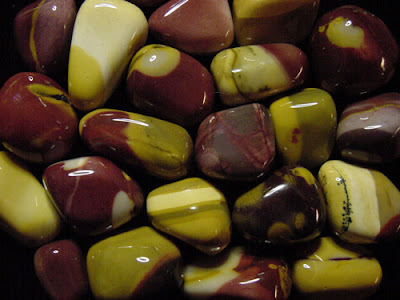 Lore: Worn by shamen for protection, jasper's solar energy helps in the practice of magic. It brings awareness which allows celebration during periods of isolation. 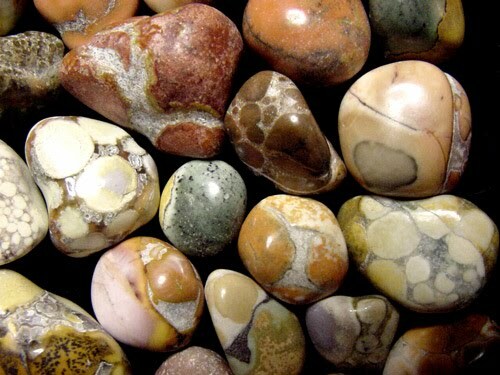 Geology: Polychrome Jasper is a form of opaque, multi-colored chalcedony which occurs in massive formations. 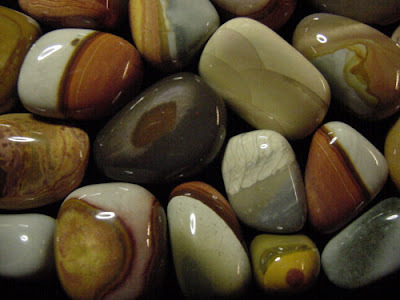 Polychrome Jasper sometimes goes by the name "Royal Savannah Jasper." Lore: Rainbow Calsilica is a recently discovered multi-colored layered stone being used for Zuni fetish carvings as well as beads and cabochon cut stones. Geology: Rainbow Calsilica is a microcrystalline calcite bonded with the amorphous clay mineral allophane. Silica is also present. It has been described as vein matter or fracture fill formed when a copper push cut into volcanic rhyolite host rock. 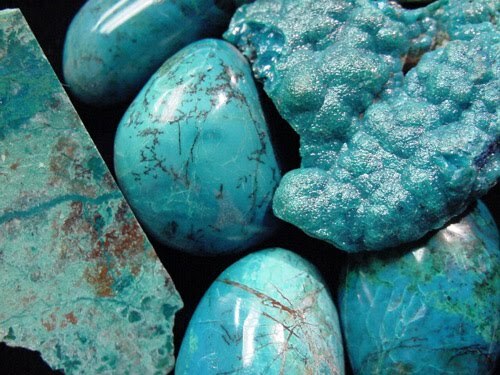 A stabilization process similar to that used with turquoise has been applied to it. 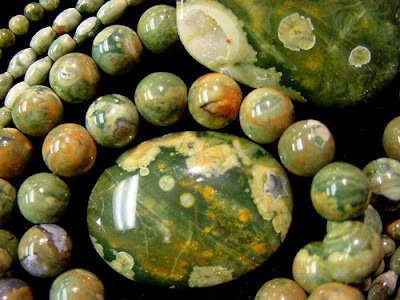 Lore: Rainforest jasper is the “Stone of Resolution,” helping clear issues of the past and bring the unresolved to completeness. It eliminates distractions and dispells procrastination. It enhances ability in the fields of architecture and construction. 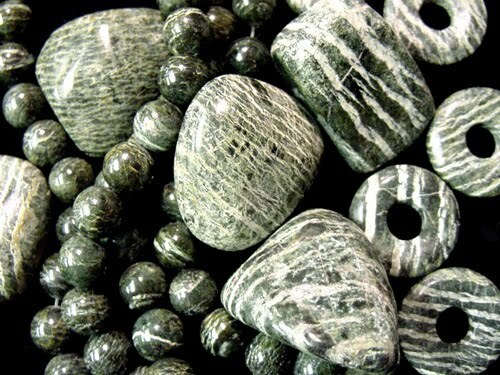 Rainforest jasper supports listening as well as all forms of communication. It is calming to animals. Geology: Rainforest jasper is a spherulitic rhyolite exhibiting shades of green with tan, yellow or blueish "eyes." Rhyolite is a microgranular form of granite that has cooled quickly. Lore: Ruby stimulates mental concentration and enthusiasm. 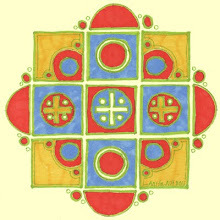 Stone of the Sun in ancient European and East Indian cultures, it represents the life force, inner fire, love and passion. 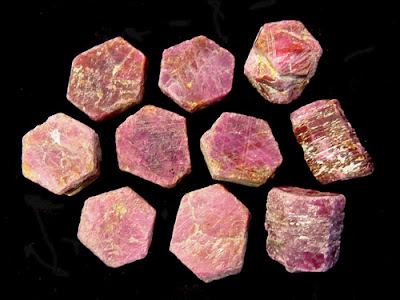 Geology: Ruby is the name for red corundum. It is an aluminum oxide and can range from rose to a dark purplish red color from traces of chromium. It forms hexagonal, barrel-shaped crystals found in alluvial deposits. Ruby is heavy and is mined by panning. 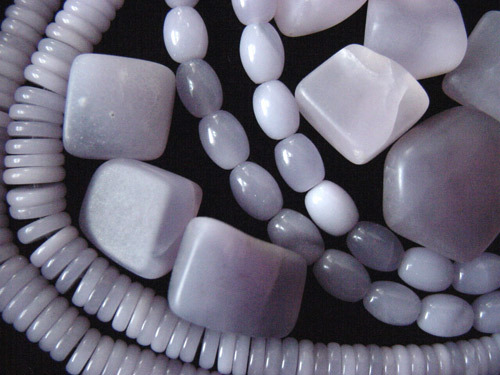 Lore: Selenite, named for the ancient Moon Goddess Selene, provides for mental clarity. Like a sharp sword of awareness, it cuts through unconscious assumptions about ourselves and our surroundings. Lovers can trade selenite crystals to help reconcile differences. Selenite activates the aspect of our nature that is true spiritual feeling. Geology: Selenite, a crystallized form of gypsum, is a hydrous calcium sulfate. It is one of the first minerals formed by evaporating salt water in land locked bodies isolated from the open ocean. 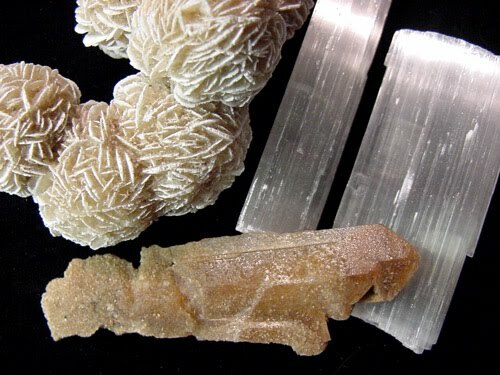 Pictured are three varieties of selenite: a cluster known as "Desert Rose," white selenite, and brown "Hourglass" selenite from Jet, Oklahoma. Lore: Serpentine enhances the meditative state and is useful in the rise of kundalini. Calming in cases of stress and nervousness, it aids in balancing mood swings. It helps to establish boundaries and find inner peace. Geology: Serpentine forms during the metamorphosis of alkaline igneous rocks. The color may range from olive green, yellow-green, to light green. 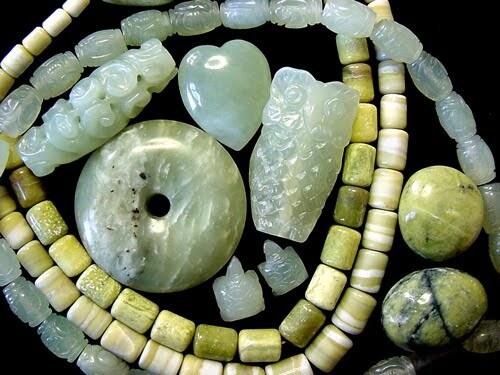 It is often called "New Jade." Lore: Stromatolite helps free the mind from suspicions built on the past, encouraging invention and discovery. The energy of Stromatolite serves to cleanse the environment in which it rests, and stimulates positive behavior modification in children. Geology: Stromatolites are fossil algae, sometimes called “picture algae,” that thrived in warm aquatic environments and built reefs similar to today’s coral. 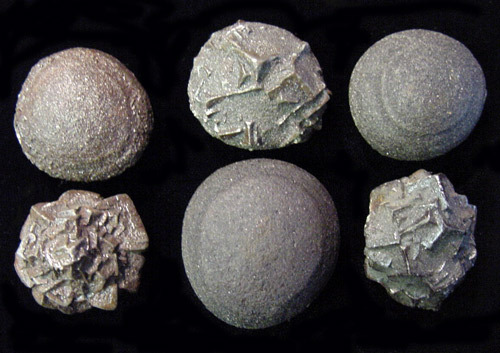 The specimens below from England, with their unique pictures created by algae in limestone, are over two billion years old. As well as being the oldest record of life on earth that can be seen without magnification, stromatolites are also the longest living forms of life on this planet. They can be traced back 3.5 billion years to the early Archean eon. The photosynthesizing cyannobacteria that formed the stromatolites’ colonial structures are believed to have been responsible for the creation of the earth’s oxygen atmosphere. They were the dominant life form on earth for over two billion years. Now nearly extinct, modern stromatolites were first discovered in Australia in 1956. They live a precarious existence in only a few localities worldwide. Known locations include the thermal springs of Yellowstone National Park, lakes in Antarctica, and the ocean off the Bahamas. Lore: Sulfur has been used by South American and Mexican Indians in ceremonial healings and is thought to synthesize the four directions, Mother Earth and Father Sky. It eliminates depression, negative thoughts and emotions, and serves as a channel linking the soul with the physical world. Geology: Sulfur is an elemental mineral with an unmistakable deep yellow color and a hardness of 2. Specimens should be protected from moisture. 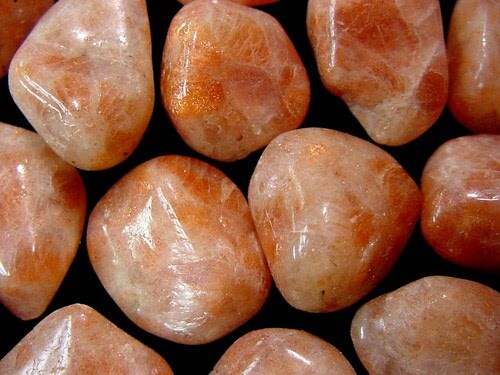 Lore: Sunstone can be used to clear and energize the chakras. It increases vitality, independence and originality, and provides luck in games. In medicine wheel rituals, it is placed at the center for contact with spirit guides. Geology: Sunstone or oligoclase is an aventurine feldspar which shows brilliant metallic reflections due to light interference on tiny included hematite or goethite platelets. It is sodium calcium aluminum silicate. Lore: Thunder eggs are named after a myth which tells that they were thrown upon the earth by angry gods. They are used to attract like-minded people, instill a sense of community, and to decrease anger and hostility. 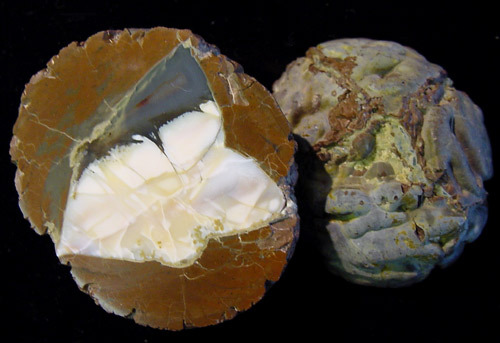 Geology: Thunder eggs are spherical agate-filled nodules. All of them have a characteristic star frame, but no two are ever alike. Agate, a form of chalcedony, belongs to the quartz family of minerals. Volcanic action created cavities and gas pockets that were later filled by silica. The cavities then became solidified, producing the agates dug today. Lore: Variscite encourages truthfulness and authenticity. It lifts the spirits, but also has a calming effect. It supports sobriety and rational thinking. 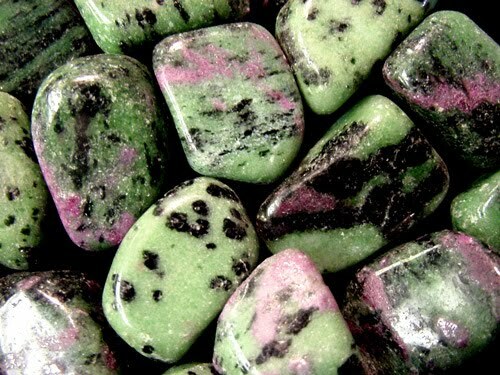 Variscite helps us become spiritually aware and perceptive. Geology: Variscite is a translucent green phosphate with a vitreous or waxy luster. It commonly occurs in massive form, or as crusts, veins, or concretions where water containing phosphates has altered aluminum-rich rocks. 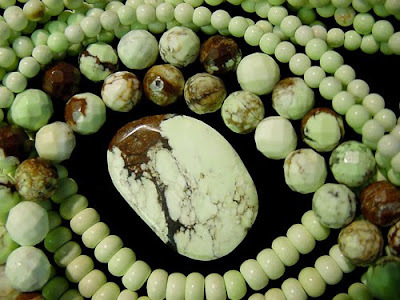 Lore: Magnesite encourages dynamic ideas and vivid imagery. It eliminates self-deceit and instills peace during meditation. Use magnesite to ground the intellect and allow the crown chakra to open. Magnesite is used in crystal healing to relieve the symptoms of PMS. Geology:Magnesite is magnesium carbonite. 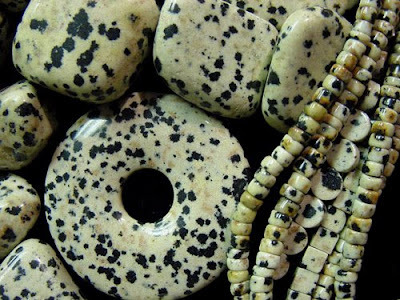 “Wild Horse” magnesite is the marketing name for a new find mined in southern Arizona. Predominantly brown with white plumes, it is magnesite mixed with hematite. Its appearance resembles the pattern on the Appaloosa horse. Lore: Yttrium fluorite supports the state of self fulfillment. Its energy helps service oriented professionals maintain an attitude of understanding and detachment. Yttrium fluorite is used by psychics and clairvoyants to calm and focus the mind, often in combination with lapis lazuli, sodalite, amethyst, and clear quartz. Geology: Yttrium fluorite, or yttrofluorite is a rare and extremely dense form of light purple fluorite exhibiting a fine translucency. In this variety of fluorite, yttrium has partially replaced the calcium in its structure. Lore: Serpentine enhances the meditative state and is useful in the rise of kundalini energy. Calming in cases of stress and nervousness, it aids in balancing mood swings. It helps us to establish boundries and find inner peace. 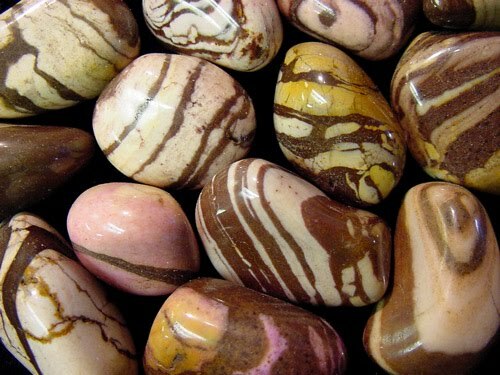 Geology: Zebra stone is a banded form of serpentine. It forms during the metamorphosis of alkaline igneous rocks. The color varies from dark to light green. 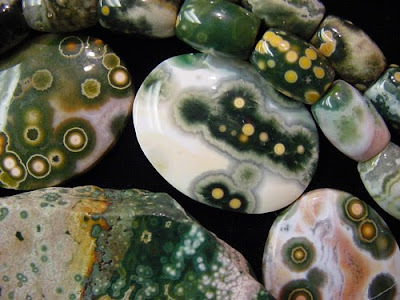 Lore: Zoisite with ruby is said to be a strengthener of the heart and general health. Supports trust in the universe and assists in releasing fears. Increases utilization of talents and is a power stone for those in service. 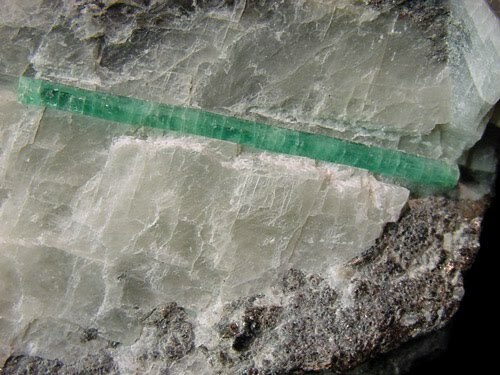 Geology: Zoisite is calcium aluminum silicate. Chrome green massive zoisite from Tanzania is embedded with dark red ruby crystals and has black chromite and hornblende inclusions. Also called anyolite, it occurs in alteration areas of basic igneous rock. Geology: King Cobra Jasper is a variety of opaque micro-crystalline quartz distinguished by patchy, sometimes orbicular patterns in combinations of soft purples, greens and creams mixed with earthy browns, oranges and beiges. Lore: Kansas Pop Rocks, also called “Energy Stones,” are used for auric healing and chakra balancing. They generally have either smooth (female) or bumpy (male) surfaces. The two “sexes” may be used together or separately to balance or emphasize chosen polarities. Kansas Pop Rocks provide good grounding of high energy states. Geology: Kansas Pop Rocks are pyrite concretions. Bridging organic and inorganic worlds, they are crystalizations of pyrite over a nucleus of fossilized seashell. 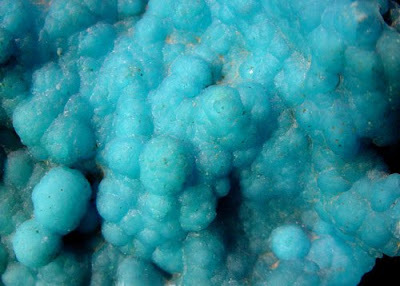 Lore: Hemimorphite assists in self-transformation and personal evolution, fostering joyousness and creativity. It teaches us to take control of our own happiness and to reach our highest human potential. Used since ancient times, hemimorphite helps in the understanding and utilization of the powerful ancient healing techniques to maintain or regain health. Geology: Hemimorphite is a hydrated zinc silicate. It forms transparent colorless crystals common in lead, zinc and silver deposits. It also occurs as blue botryoidal crusts. Lore: Hematite is a stone for the mind. Enhances memory and mental dexterity. Dissolves negativity and provides for smooth grounding, peace, and inner happiness. It attracts kind love and loving relationships. Geology: Hematite occurs as a hydrothermal and replacement mineral, and in igneous rocks as an accessory mineral. Common habits are massive, fibrous, stalactitic and botryoidal. It is heavy and opaque with a dull metallic luster. Geology: Gaspeite forms rich limey green masses as a secondary mineral in nickel sulfide deposits. Named for the Gaspe Peninsula where it was first discovered in 1966, it is known as “Allura” in Australia where it also occurs. Lore: Known as the stone of successful love, emerald supports sensitivity, loyalty and domestic bliss. It brings harmony to all areas of life, quieting the emotions and opening the heart. It helps maintain rhythmic breathing for meditation. It brings a beneficial outcome to legal matters. Geology: Emerald is a green beryl colored by chromium. They have been treasured since the time of Cleopatra. The most famous mines are those of Colombia. Emeralds of various localities can be recognized by their inclusions. Lore: Dalmation stone encourages playfulness and strengthens our lighter side. A good stone to share in relationships, it supports constancy, fidelity and devotion. It helps us disengage from outmoded behavior patterns. It is useful in the calming of animals. Geology: Dalmation stone is massive tan quartz microcline containing black tourmaline of volcanic origin scattered throughout. It was named based on its resemblance to a dalmation’s fur. 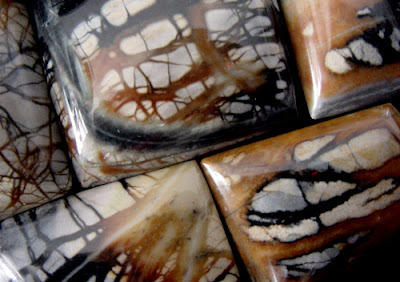 Lore: Crazy lace agate helps us to reach extremely high physical levels. It helps to recover from bio-rhythmic lows. It encourages laughter and provides insight into the many paths leading to awareness. 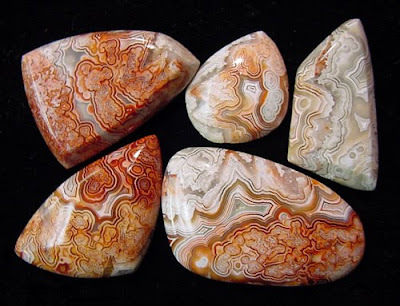 Geology: Crazy Lace Agate, or Mexican Lace Agate, is a variegated form of chalcedony displaying lace configurations or paisley patterns in a combination of red, white, gray and yellow. Lore: The cowrie is an ancient symbol for creation, birth, and re-birth. It can help us actualize a spiritual re-awakening. Used for manifestation, it will bring good fortune and affluence. The cowrie can inspire the creativity of excellence. They are a favorite element of female adornment in the African culture, and are a symbol of power in the Fiji and Solomon Islands. 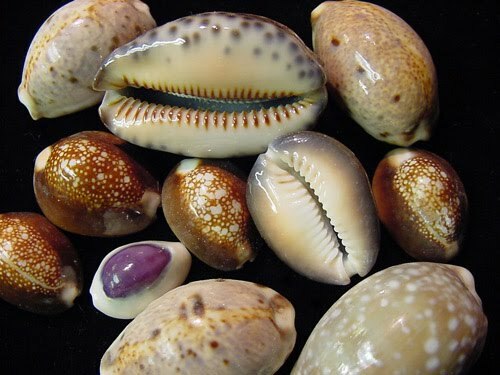 Biology: Cowries are snails in the family Cypraeidae. There are over 250 known species living in warm sea areas. Lore: Copper stimulates initiative, optimism, diplomacy, and independance. It can magnify the transfer of energy from other minerals or from a healer due to its ability to conduct electrical impulses. Reputed to bring luck, especially in the recovery of property. Geology: Copper is a native element forming in volcanic rocks and sulfide deposits. The usual habits are dendritic and massive, rarely crystaline in the form of cubes and octahedrons. Michigan’s native copper is used to form these interesting sculptures which are man made on the Keweenaw Peninsula. Molten copper at 2200 degrees Fahrenheit is poured into straw which is immersed in water. The straw is burned away and the copper solidifies. On New Years day, according to custom, early miners used lead in the same process as a method of fortune telling. Good or bad luck for the year to follow was determined by the shape and size of the sculpture formed. Lore: Chrysocolla eases emotional heartache and increases our capacity to love. Native American tribes used it as a healing stone for calming upset feelings. It helps re-build relationships and is purifying to the home and the environment. Geology: Chrysocolla is formed in the oxidation zone of copper ore minerals where surface water containing acid dissolves copper out of the rock. 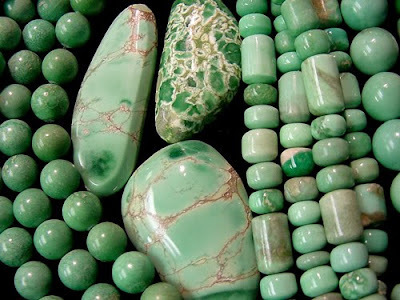 It is called Eilat stone when intergrown with turquoise and malachite. 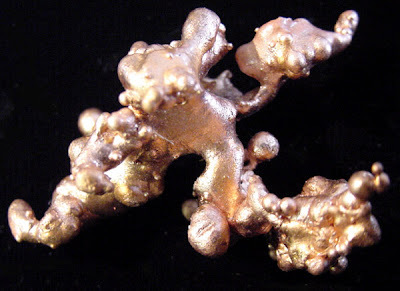 Lore: Chiastolite gives us persistence in realizing our identity and our life’s task. It enhances conscious awareness and is used as a sign of devotion. It calms fears, nervousness, and feelings of guilt. 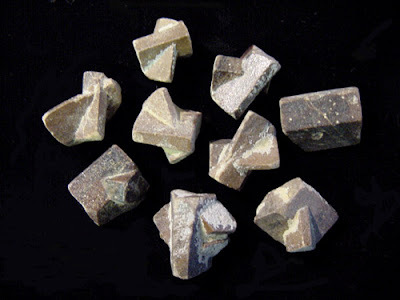 Geology: Chiastolite is an andalusite occurring in long prisms formed in carbonaceous clay slates. Growth occurs in layers with carbon deposited along the crystal edges as diagonal cruciform shapes are formed. It is also known as cross-stone. 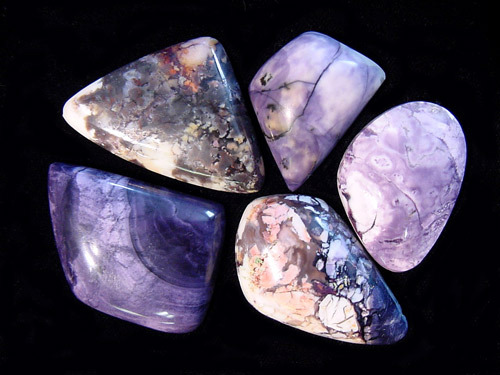 Lore: Charoite brings spiritual truths to dispel illusions and worst fears. Helps to cope with profound changes. Geology: Charoite originates from Siberia where it was first discovered in 1978. Occurring as violet masses, charoite is formed in the zone of contact between magmatic and metamorphic rocks from the combination of alkaline magmatic solutions with mineral-forming substances of the surrounding rocks. Lore: The silicon content in laboratory produced silicon carbide has similar properties to that of natural quartz. It has been employed for memory enhancement and to improve manual dexterity. Use to amplify positive feelings. 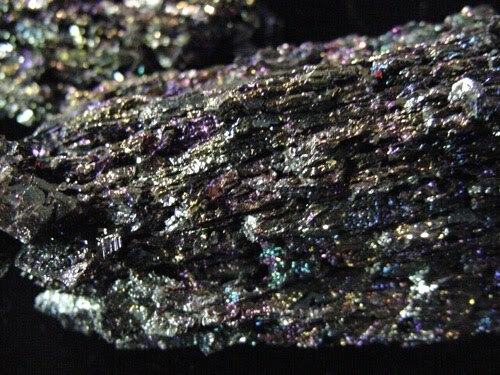 Geology: Carborundum, or silicon carbide is a man-made mineral invented in Pennsylvania by Edward Goodrich Acheson in 1890. The result of a failed attempt to create diamonds, carborundum was formed from electrically fusing a mixture of clay and carbon. Carborundum, used as an industrial abrasive, is hard enough to scratch glass. More recently it has been employed as a semiconductor. Silicon carbide, found in Arizona within a Canyon Diablo meteorite by Dr. Ferdinand Henri Moissan, has been named Moissanite. With a tetrahedral crystalline structure and an appearance similar to diamond, naturally occurring moissanite is rare. Gem quality moissanite is being manufactured and sold as a low cost alternative to natural diamonds. Lore: Bronzite is the stone of courtesy. It is helpful in all facets related to service and assistance. It stimulates decisiveness and courage. Geology: Bronzite, or ferroan enstatite, is a magnesium iron silicate. It forms stubby prismatic crystals and, more commonly, greenish-brown or bronze-brown compact masses with a submetallic luster. A member of the pyroxene group, its associated minerals are serpentine, magnetite, enstatite and olivine. 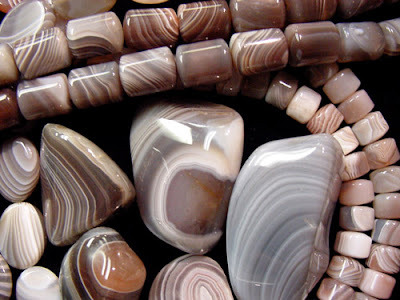 Lore: Botswana agate encourages love. It stimulates exploration of the unknown, helps to release repressed emotions, and enhances creativity. Geology: Botswana agate is composed of layers of finely fibrous quartz. It is found in the form of nodules, its thin parallel bands following the contour of the cavity where the silica gel solidified. The name is derived from the African country in which it is found. Lore: Blue lace agate is a highly inspirational influence when used for inner attunement. Helps one reach high spiritual spaces and enter into high-frequency states of awareness. Useful for building confidence in public speaking. 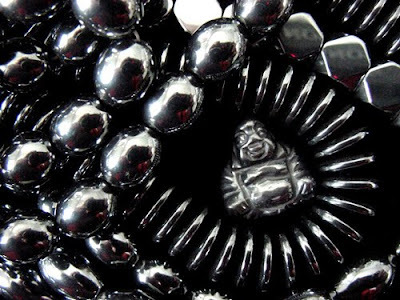 Encourages focus and calm centeredness. 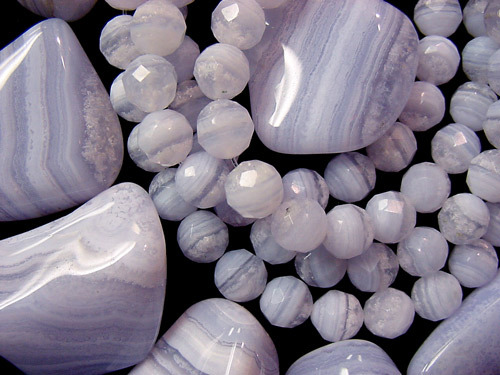 Geology: A variegated form of chalcedony or microcrystalline quartz, blue lace agate displays a blue and white lace pattern. 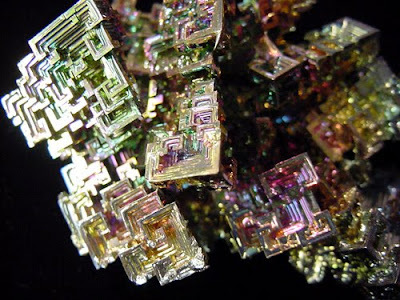 Lore: Bismuth is a stone for transformation, allowing for orderliness and calm during the state of change. It stimulates cohesiveness in groups and relationships, supporting progression towards a common goal. Relieves feelings of emotional and spiritual isolation. Geology: Bismuth is a silvery-white metal. Lab-grown “Hopper” crystals have a stairstep shape resulting from the edges growing more quickly than the crystal faces. Irridescent surface colors are due to surface oxides. Lore: Bertrandite supports a smooth transition when undergoing change. It assists in the verbalization of hidden feelings. Beryllium Opal is reputed to enhance sexual energy. Geology: This relatively new material, an opalized fluorite, is also called "Tiffany Stone" and Ice Cream Opalite. It occurs in a mixture of cream or white opalite with purple fluorite, traces of yellow bertrandite, along with other red or black mineral inclusions. Mineralized beryllium nodules altered by a fluorine-rich solution form in the sequence dolomite-calcite-chalcedony-opal/fluorite. 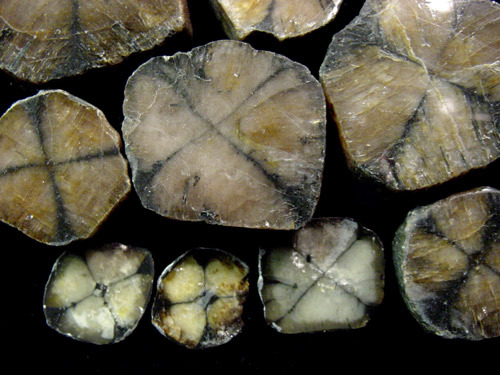 The nodules are recovered from an area where the bertrandite rock is mined commercially for the recovery of beryllium used in the manufacture of satellites and aircraft. Bertrandite is beryllium silicate hydroxide. Kumihimo Spiral Seed Bead Bracelet Instructions - Part 1. 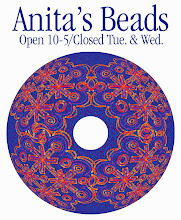 Kumihimo Spiral Seed Bead Bracelet Instructions - Part 2.